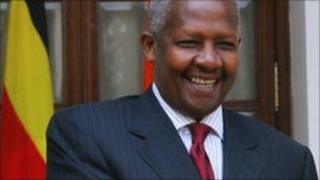 Uganda's Foreign Affairs Minister Sam Kutesa and two other officials have resigned after being accused of corruption. Mr Kutesa, chief whip John Nasasira and junior labour minister Mwesigwa Rukutana said they had stepped aside to clear their names in court. They are accused of abuse of office as well as financial loss related to the 2007 Commonwealth summit in Uganda. Their case is due to come before an anti-corruption court on Thursday. The government allegedly lost some $150m (£95m) in various scams during the 2007 Commonwealth Heads of Government Meeting (Chogm) in the capital, Kampala, reports say. Former Vice-President Gilbert Bukenya was charged in July. He denies that he benefited from a $3.9m deal to supply cars used to transport dozens of heads of state during the summit. Some MPs from Mr Bukenya's Buganda ethnic group had accused the government of selective justice by failing to prosecute anyone else. Last week, the Inspectorate of Government - the body charged with fighting corruption - said Mr Kutesa, Mr Nasasira and Mr Rukutana would be charged. In a joint statement, they denied the charges and said they were stepping aside to clear their names in court, the AFP news agency reports. "We shall definitely take opportunity to plead our innocence and demonstrate that we are not guilty of the offences charged," the statement said, AFP reports. President Yoweri Museveni said the three officials chose to resign. "That's their decision because what we want is the truth," he told a news conference. Mr Museveni sacked Mr Bukenya in May as part of a cabinet reshuffle. In a separate development in parliament on Monday, MP Gerald Karuhanga accused Mr Kutesa, Prime Minister Amama Mbabazi and former Energy Minister Hilary Onek of taking multi-million dollar bribes from a UK-based company, Tullow Oil. The ministers and the company strongly denied the allegation. Mr Museveni backed their denial. He said he first heard of the allegations - made in documents tabled in parliament by Mr Karuhanga - last year. He ordered both private investigators and police to look into the claims. "They have concluded their investigation. These documents are a forgery," Mr Museveni said. Uganda's parliament voted to suspend all oil deals until a petroleum law is enacted.